The first third of this Sphere is all about the California wine country, with explanations of the white and red varietal wines; how they are made, how to identify each one, what food to serve with them, how to stock a wine cellar, and how to host a wine tasting party. Some of the recipes using wine include a pot roast with red wine, fish with a white wine sauce, a cheddar soup with Chablis, a zabaglione with Marsala, and one that I decided to try called Sunshine Sherry Cake that starts with a mix. Doctoring up cake mixes was big back in the early ’70’s. When I told my mom I was making a sherry cake from Sphere, she asked me if I remembered a Harvey Wallbanger Cake she used to make, and a cream sherry cake that my grandmother loved. This cake reminded me of grandma’s sherry cake from a mix which is why I decided to try it. The cake uses a lemon cake mix, instant lemon pudding mix, oil, sherry, eggs, and freshly grated orange peel. It’s baked in a tube pan and when cool, is sliced in half. 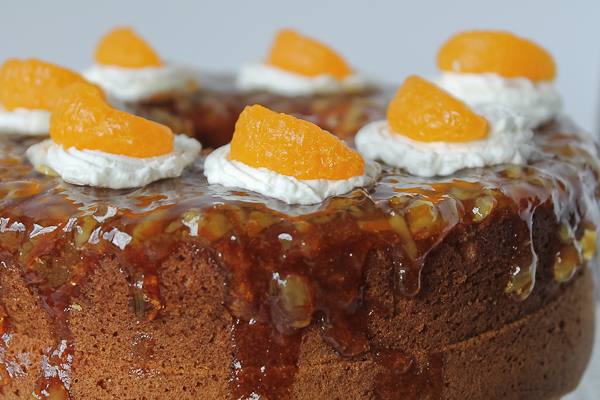 A glaze is made from orange marmalade and sherry, spread in the middle and on top. Cream is whipped with a little sugar, more sherry, and piped on top. Mandarin orange garnishes add the colorful finishing touch. It was beautiful and delicious! One of my favorite features in the old Sphere magazines was one called His Dish in the early issues. 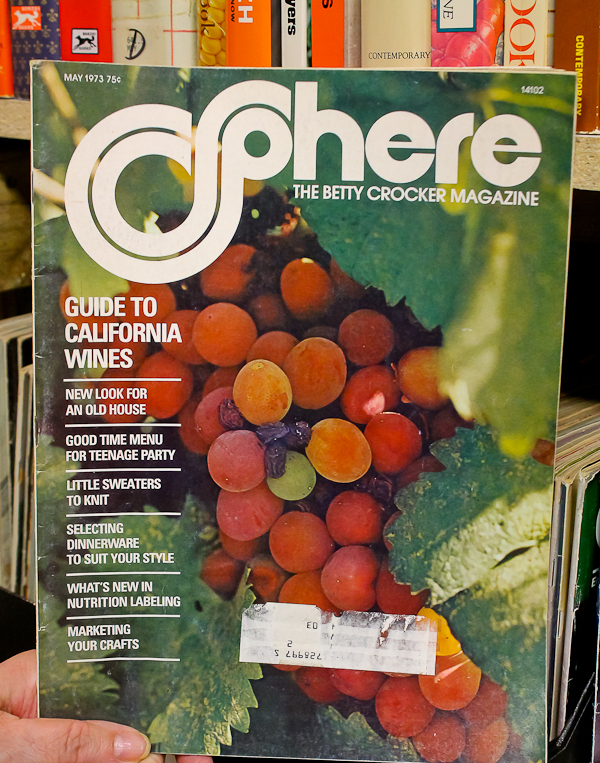 This May issue was about a young man who met James Beard once in a New York City restaurant where they discussed the menu and the wine of the evening. The conversation stuck with him one day as he was experimenting with lamb, and he remembered how James Beard had a technique for braising lamb in sherry and soy sauce. 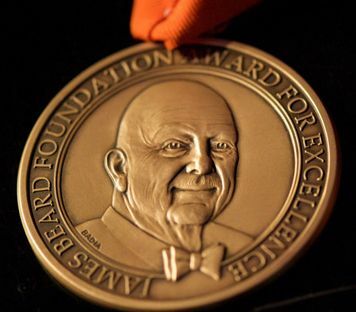 Reading about James Beard reminded me that tonight the James Beard Awards are taking place right here in Chicago for the first time! The James Beard Foundation has always hosted the awards in New York City. They have now decided to take the show on the road beginning this year with Chicago, to be held at the Lyric Opera House. To get the full list of nominees and to watch a live streaming go here. 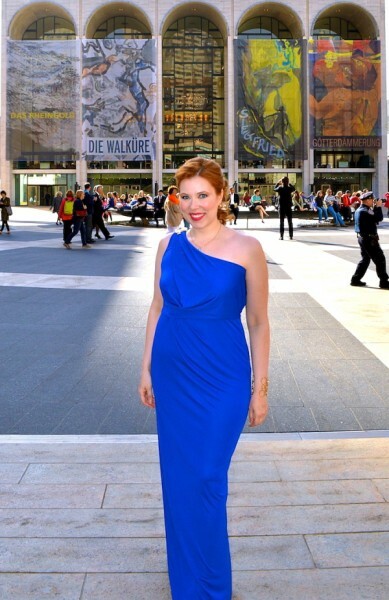 I’m sure it will be wonderful in Chicago, but my daughter Kristina always attended the awards in New York at Lincoln Center and she could walk there from her apartment. She said she is sad not to be there this year, but here she is from a past year. It’s a black tie affair! The pages following the James Beard story included a party for teenagers; how to make a dress for your high school graduate complete with layers of ruffles; how to buy dinnerware; and a speedy spaghetti for kids. Here’s the recipe for the Sunshine Cake to eat while you watch the live stream of the James Beard Awards tonight. Heat oven to 350 degrees. Grease a 10-inch tube pan; set aside. Beat cake mix (dry), pudding mix (dry), oil, sherry, eggs, and orange peel in a large mixer bowl on low speed for 1 minute, scraping bowl occasionally. Beat on medium speed for 4 minutes. Pour batter into prepared pan. Bake until top of cake springs back when touched lightly with finger, about 40-45 minutes. Cool right side up on wire rack for 15 minutes. Remove from pan and cool completely. Cut cooled cake in half horizontally to make 2 layers. Place top half of cake, cut side up, on a serving plate. Pour half of the cooled orange-sherry glaze over cut side of cake; spread to the edges. Place remaining layer, cut side down, on top of glaze. Spread remaining glaze over top of cake, allowing some to drip down the sides. 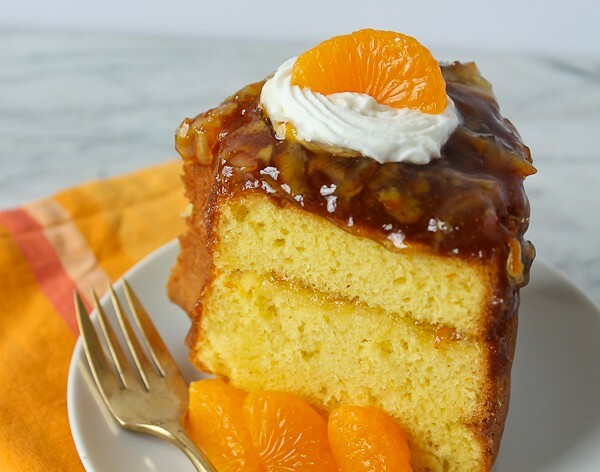 Spoon or pipe dollops of the sherry whipped cream on top of cake; garnish with mandarin orange segments. Orange-Sherry Glaze: In a small saucepan, heat together 1 jar (16 ounces) orange marmalade with 3 Tablespoons sherry. Heat to boiling; reduce heat and simmer, stirring occasionally, for 5 minutes. Cool to room temperature. Whipped Cream-Sherry Topping: In bowl of electric mixer using whip attachment, beat 1 cup chilled whipping cream, 2 Tablespoons granulated sugar, and 1 Tablespoon sherry until stiff peaks form. Happy Birthday to my brother Paul! And then there are the magazines…. Have you ever run across a recipe for Cantaloupe Syrup? I saw this in a Sphere magazine years ago. Made it and it was wonderful! Tasted almost like a fruity honey. Was great on pancakes and waffles. Send it to me if you ever see it, please! Penni, I know exactly what recipe you are talking about. I’ll get back to you on that one! Penni, I am sending you the recipe in an email! Watch for it. Looks yummy, Debbie. It made me think of a recipe from my 1st PBO -’68? ’69? – i had to go pull the book to check the one I remembered out. It was called SHERRY CREAM FUDGE cake ( 9 x 13). I never made it, but a neighbor did .. and it was a favorite of hers. Guess there must have been lots of versions of this … and they all sound great! Shirley, I think sherry cakes were very popular at that time. I’ll have to go check out that PBO recipe. I don’t remember it, but it sounds good! I am not real fond of sherry, but this really is a beautiful cake. I wonder if I could substitute the sherry with something else, say orange juice or a different wine/liqueur? Penni, I don’t know why not. Some liqueurs might be too thick and sweet or could be used sparingly for flavor. Orange juice might work or maybe 1/2 juice, 1/2 other wine or even water; plus you could use juice in the glaze and whipped topping. I think it is one of those cakes that you could play around with to suit your taste. Good advice…think I will try playing with this and see what I come up with. Wow! I just found your blog because I was looking through my classic Perla Meyers cookbooks today and decided to google her to see what is happening in her life. So I found your site. Well, I saw this post on Sphere Magazine and got so excited. I used to have a subscription to that magazine. At some point I got rid of them all. If you ever find two cake recipes, and I think they were in two consecutive years, in November, one was a gingerbread cake and one was a jam cake. I am especially looking for the jam cake. I have looked online but have never found one that matched that particular recipe. If you have those and can share them I would be very grateful. It’s funny, I have been thinking about culling my cookbook collection, but after seeing your extensive catalogued collection, I am not going to do it. I was just telling my daughter-in-law today that I should get a Pinterest account and start saving recipes I find on the Internet. But I LOVE to look through cookbooks to do meal planning. what can I say…you have to understand it! Thanks for reaffirming my passion for cooking and cookbooks! Carol, I love your message! First of all, I am always happy to hear from other Perla fans; and as for Sphere, you would not believe all the Sphere fans still out there after 40 years! There is hardly a week that goes by where I don’t hear from someone looking for a Sphere recipe that they loved and remember. I will do my best to find your requested recipes and get back to you. Do you happen to remember what years they might have been from? But what tickles me the most about your message is that I helped in any small way to reaffirm your cookbook passion! And yes – start that Pinterest account! Go to my Pinterest page and you can pin all my cookbooks to your board to get started right away. Keep in touch!